There a lot of active people who wear plus sizes nowadays. I think think that even the manufacturers and retailers are becoming aware of this fact and offer a activewear in plus sizes that come in moisture wicking and body fit modern fabrics. 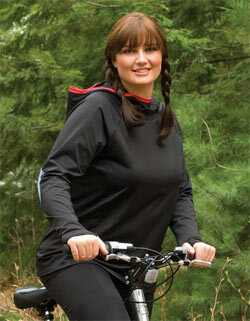 Here is one of my favorite brands for plus size workout clothing: QuikWik® and a comfortable Hoodie with Elbow Patch. Contrast-colored elbow patches and piping details lend cozy charm to this moisture-wicking edition of the classic hooded top. Pull it on for outdoor workouts or everyday comfort. High-performance, anti-microbial QuikWik® is one of our all-time best sellers. This Junonia® exclusive wicks moisture, dries quickly and resists odor, providing sleek shaping and comfort without binding or chafing. (Size 1 length 29”). 90% Micropoly/10% Lycra. Machine wash cold. USA. Close fit. Treat yourself to some glitter and celebrate the holidays this year in the season’s hottest jeweled look with this perfect empire waist evening gown in green. Here is my suggestion for inexpensive, simple, yet chick separates to party in style this holiday season. 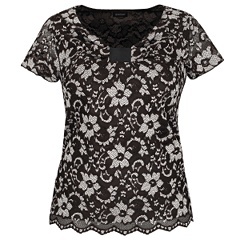 # This simple lace tee is a great piece to wear for any special occasion. Short sleeves. Cinched detail at bust. Lined. Lettuce edged sleeve hems. Unfinished hemline. # Approx 26 1/2″ long. # Women’s 14/16-30/32. Combine the tee with a black skirt and an elegant jacket. 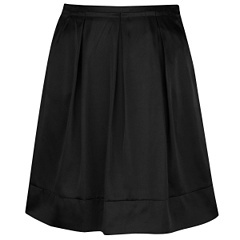 # Box pleating gives this satiny skirt a crisp ladylike style. Side zip with hook and eye closure. Banded hem. Woven. # Approx 23 3/4″ long. This is the perfect clutch to complete all of your favorite looks! Fake leather. Metal closure and trim. Turnlock closure. Inner zip pocket. Lined. Imported. Channel your inner pin up girl in these bow trimmed pumps! Man made materials. Imported. Cloud Heel Strike PadFlexible non-slip sole. Approx 3″ long. W/8/13. A beautiful calf-length boot that doesn’t sacrifice style for comfort. Gel insole in the heel. Zipper closure down the instep side.